Looking for the best quality Loose diamonds online ? 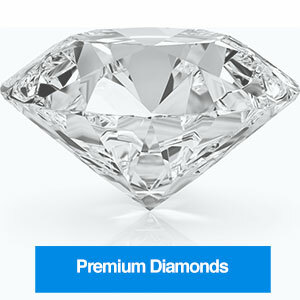 Our premium diamonds are hand picked high quality diamonds that represent the top 1% diamonds in our range. These diamonds are excellent quality in the most popular and desirable sizes and come supplied with individual certification and laser engraved. For these diamonds we only offer round shaped diamonds of between 1 and 1.5 carats. Our selection of premium diamonds only includes internally flawless or loupe clean diamonds of the best colours and cuts. Our premium selection from 1 cts to 2 cts , in D-H colors and in IF to VVS1 clarities.